Customers don’t care how much you’ve invested in web and mobile development; they just want superior service and the right products when they need them. Engaged customers spend more. Give them an outlet to engage 24/7. Engaged customers produce a 23% premium in wallet share, profitability, revenue, and relationship growth compared to only 13% for disengaged customers. Keeping shoppers digitally engaged, and happy, is more important than ever. For retailers with store-fronts, it’s also critical to drive traffic into stores for relevant shopping experiences. Alternative players are popping up every day, scooping up both online and in-store business. Chatbots are a way for you to move out of “keep-up” mode, and get ahead of the competition. Gartner predicts that 30 percent of interactions with new smart technologies will be via conversations with smart machines by 2018. 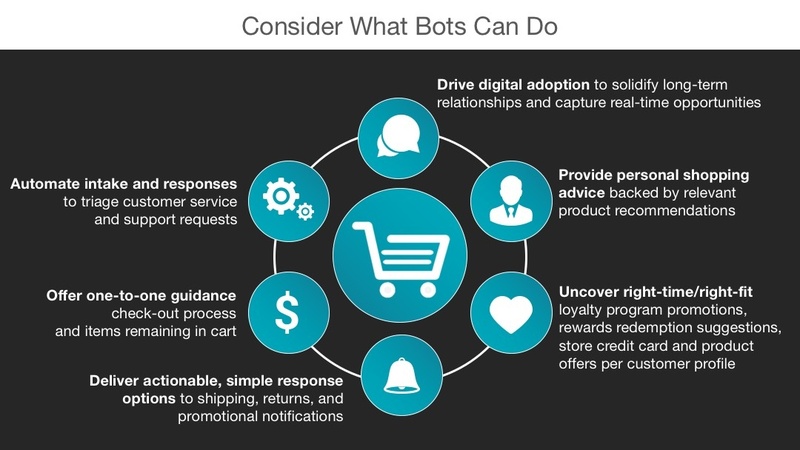 Chatbots turn the traditional digital experiences your shoppers are used to into conversational, personalized, and instantly gratifying engagements. These engagements are available 24/7 at the moment a shopper wishes to interact. Instantly receive real-time advice from a personal shopper and advocate for your brand. Simply request status or receive alerts on in-store inventory available for purchase and pick-up. Quickly access customer service across all channels - text, email, mobile app, website, call center, or at a storefront. Conveniently purchase products in a simple, message-based engagement. Don’t overlook what chatbots do for the retail enterprise workforce. It’s powerful. From inventory management to IT support to marketing and sales, retailers struggle with familiar challenges that continually hinder agility, growth, and profitability. Despite the huge investments in enterprise software, employees find it more difficult than ever to get work done. Chatbots keep you out of the endless cycle of spending to build more custom apps and websites to meet the needs of today’s workforce. Chatbots power some of the most widely-used third party apps in the business world, to help workers get tasks done easily and efficiently. Connect disparate systems and apps to streamline your digital workflows. Deliver relevant updates, automate tasks, provide on-demand reports and execute workflows for inventory management. Equip staff with easy-to-use messaging, collaborative workspaces, and secure file sharing. Cut time and overhead costs across teams, departments, and locations with true multitasking and simpler communications. You’ve done digital. Do it better. Retailers looking to get ahead and enhance digital transformation efforts should consider AI-rich chatbots and offer both employees and customers conversational daily engagements. This technology maximizes digital and in-store offerings to foster loyalty and drive shoppers to purchase with right-fit/right-time conversations. A chatbot platform enables the enterprise to build and scale quickly and achieve ROI faster.